A pool enclosure custom designed and built by Flowers Aluminum Construction is a great asset to your home. It provides you with a comfortable outdoor area without the problems of pesky bugs and debris. This will reduce the excessive time and expense of maintenance to your pool, as well as give your family quality time to enjoy the great Florida lifestyle. 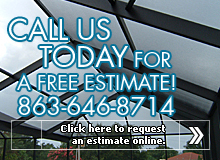 Many pool enclosure upgrades are available, and we can work with you to develop a custom design that looks great and matches up well with your home. Call Flowers Aluminum Construction, Inc., today for more information about how a new swimming pool enclosure can benefit you!